Considering the length and nuisance of my left knee injury, I was more than willing to learn about a running technique that could possibly help cure and/or avoid future injuries, so.. 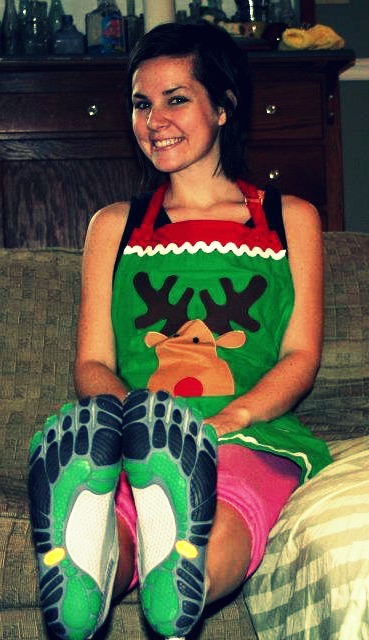 I got Vibrams for Christmas!! 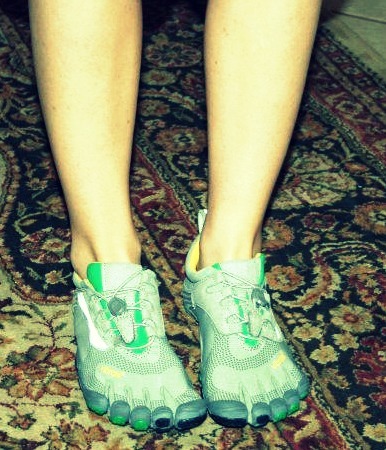 I ran one mile (very slowly) in them on Christmas day and my calves are still sore, but my knee wasn't too bad. I take this as a ginormous sign that I'm supposed to build up my foot strength and all my running problems will be gone once I find the perfect stride. Just let me think this way. I also got this super cute apron to cook all my vegan cookbook recipes in! (Don't mind the pjs and non-makeup-face.) I will keep you all updated on my Vibram running experiences. I'm pretty excited about it. Also, I highly recommend you read this book if you have even the slightest bit of interest in running. It's amazing. I need to get my husband some of those shoes. They kinda weird me out, but it sounds like they really improve your form. And so jealous of your kindle! Ohhhh Awesome!!! Training for a marathon right now!!! Great reading inspiration. Thank you:)you look Adorale BTW!!! Thanks for your comment :) Ooh wow those kinda scare me but I'm also intrigued by them. Trying to get back into running as well. Go you! My husband and i bought Vibrams this past summer. We love ours! I love this post! The book looks great, you just inspired me to order it and send it to a friend of mine who just started running. Thanks! Those shoes are too histerical! DO they work I'm wondering? !